The QGraphicsTextItem class provides a text item that you can add to a QGraphicsScene to display formatted text. To set the item's text, pass a QString to QGraphicsTextItem's constructor, or call setHtml()/setPlainText(). QGraphicsTextItem uses the text's formatted size and the associated font to provide a reasonable implementation of boundingRect(), shape(), and contains(). You can set the font by calling setFont(). It is possible to make the item editable by setting the Qt::TextEditable flag using setTextInteractionFlags(). 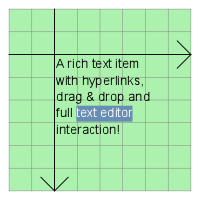 The item's preferred text width can be set using setTextWidth() and obtained using textWidth(). Note: In order to align HTML text in the center, the item's text width must be set. See also QGraphicsSimpleTextItem, QGraphicsPathItem, QGraphicsRectItem, QGraphicsEllipseItem, QGraphicsPixmapItem, QGraphicsPolygonItem, QGraphicsLineItem, and The Graphics View Framework. Specifies whether QGraphicsTextItem should automatically open links using QDesktopServices::openUrl() instead of emitting the anchorClicked signal. This property represents the visible text cursor in an editable text item. Constructs a QGraphicsTextItem. parent is passed to QGraphicsItem's constructor. Constructs a QGraphicsTextItem, using text as the default plain text. parent is passed to QGraphicsItem's constructor. Adjusts the text item to a reasonable size. Returns the default text color that is used to for unformatted text. Returns the item's text document. Returns the item's font, which is used to render the text. This signal is emitted when the user clicks on a link on a text item that enables Qt::LinksAccessibleByMouse or Qt::LinksAccessibleByKeyboard. link is the link that was clicked. This signal is emitted when the user hovers over a link on a text item that enables Qt::LinksAccessibleByMouse. link is the link that was hovered over. Sets the color for unformatted text to col.
Sets the text document document on the item. Sets the font used to render the text item to font. Sets the item's text to text, assuming that text is HTML formatted. If the item has keyboard input focus, this function will also call ensureVisible() to ensure that the text is visible in all viewports. See also toHtml() and hasFocus(). Sets the item's text to text. If the item has keyboard input focus, this function will also call ensureVisible() to ensure that the text is visible in all viewports. Sets the flags flags to specify how the text item should react to user input. The default for a QGraphicsTextItem is Qt::NoTextInteraction. Setting a value different to Qt::NoTextInteraction will also set the ItemIsFocusable QGraphicsItem flag. By default, the text is read-only. To transform the item into an editor, set the Qt::TextEditable flag. Sets the preferred width for the item's text. If the actual text is wider than the specified width then it will be broken into multiple lines. If width is set to -1 then the text will not be broken into multiple lines unless it is enforced through an explicit line break or a new paragraph. Returns the current text interaction flags. Returns the item's text converted to HTML, or an empty QString if no text has been set. Returns the item's text converted to plain text, or an empty QString if no text has been set.